TOPIC: Category order when adding media? I have a site where I have over 100 categories and subcategories combined. When I go to add media, I have to scroll through ALL of them, in a completely random order. How can I make them appear in alphabetical order, or in a tree structure as they do in the search? With that you can see real categories structure - at addind new media time. $query = "SELECT id ,name, parent_id as parent"
. "n AND published > 0"
I have tried many different variable names for ordering, but none of them seem to work. What is the variable name for sorting by category TITLE? I'd like to sort by title, but I can't seem to find what you have called the title variable. Every time I try to change it, it still just keeps sorting by "ID" instead. 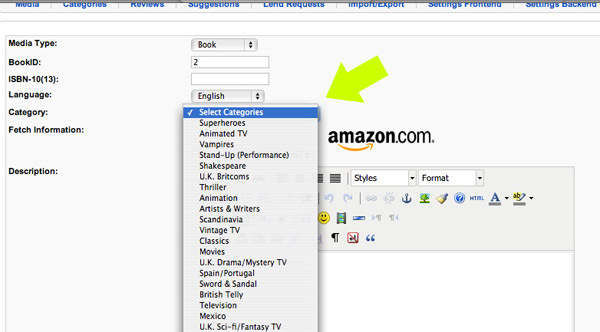 In categories - I show how we do select. If Media - that fill other! and where ordering for you need change ? that fontend or admin part ? The problem is in the admin backend, when I go to the MediaLibrary component, then "Media" > "New." When I'm adding a video, and selecting a category to add it to, my categories in the dropdown are listed in the order: "Superheroes, Animation, Vampires,..." etc., instead of alphabetical order. I see that they're listed in the order I added the categories, but I'd like to list them alphabetically by title: "Africa, Animation, Artists, British," etc. I will have over 100 categories, so need to be able to find them easily. I've tried to change the code you showed me, but the order stays the same in the backend. I've attached photo. Last Edit: 2011/11/16 20:07 By ldv.